They’re here: The top volleyball teams and players in the country, all the hitters, blockers and setters from Nebraska, Texas, Stanford and Minnesota. And they’re here for the NCAA Div. I Women’s Volleyball Championship at Nationwide Arena. Stanford and Minnesota play in the first semifinal Thursday at 7 p.m., and Texas will play defending champion Nebraska at 9:30 in a rematch of last year’s finals. The excitement is building, and thousands of volleyball fans from these four states, all over Ohio and many other areas of the country, will be in town to see some amazing athletes leaping, diving and spiking before what could be a record-setting crowd. The winners play on Saturday at 9 p.m. for the title. “Columbus has quickly become the volleyball capital of the Midwest and, you could argue, the nation,” said Columbus Mayor Andrew Ginther during a pre-tournament conference on Tuesday at Nationwide. Columbus will actually be the volleyball capital of the entire world over the next few days. The three championship games will be broadcast on the ESPN network. “And we just got some good news from ESPN,” said Kristin Fasbender, the NCAA Director of Championships and Alliances. The good news is the all-sports network switched the games from ESPN2 to ESPN, a sure sign that more and more people are watching the fast-paced and exciting game of volleyball. On the Friday, the Under Armour All-America High School All-American Match & Skills Competition will be held at the Greater Columbus Convention Center. It features the top 24 female high school players in the country – including two from Ohio – and will be broadcast on CBS Sports. The American Volleyball Coaches Association (AVCA) will hold its annual convention here during the tournament. “We expect somewhere between 2,650 to 2,700 volleyball coaches and exhibitors, which would be the largest convention in our history,” said Jason Jones, Assistant Executive Director of the AVCA. And, Ohio State will host the NCAA Div. I Men’s Volleyball Championship at St. John Arena May 4 – 6. This is the first time one city has hosted the NCAA Division I women’s and men’s championships in the same academic year. The Buckeyes are the defending champions. Why is all this volleyball coming to Columbus? The passion dates back to the 1960s, and was helped along by two pioneers: Doug Beal and Bob Price. Beal came to Ohio State to play volleyball in the late 1960s, before the NCAA even held a championship tournament in the sport. He later coached at Ohio State and was the coach of the 1984 Men’s Olympic team, the first to win gold. Beal was at the conference and will be here for all the games. His daughter, Maddie, plays for Minnesota. His son, Mitch, plays for Ohio State. The 64-team tournament has featured “more competitive matches and more 5-set matches than ever before and the level of play has never been higher,” said Beal, who is retiring at the end of the year as CEO of USA Volleyball. Beal loves coming back to Columbus. The Ohio Valley Region (OVR) of USA Volleyball is the largest in the country with about 23,000 players. 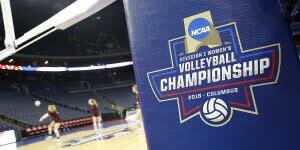 Just about every one of the American players at the 64 teams in the NCAA tournament have played volleyball in Columbus, at USA Volleyball regional and national tournaments hosted by the OVR and held at the Greater Columbus Convention Center, said Price, the Commissioner and President of the OVR. The Convention Center has hosted more volleyball games and players than any other building in the country. The NCAA Div. I Women’s Volleyball Championship is a huge event. Nationwide has a capacity of 17,840 for volleyball, which means there’s a good chance the all-time attendance mark for could be broken. The record of 17,561 was set in 2015 in Omaha. Very few tickets remain, so get going if you want to see the nation’s top players. “There will be $10 million in direct spending” from all the visitors Ginther said, adding “this just might be the best December ever for our hotels,” and it’s due to the NCAA volleyball tournament. “And this helps place Columbus on the map for more premier sporting events,” Ginther added. This is where the Greater Columbus Sports Commission comes in. “This was 15 years in the making … to bring this amazing championship to Columbus” said Linda Logan, Executive Director of the Sports Commission. And then she added that perhaps it was time “to start bidding for the 2020 or 2021” NCAA Div. I Women’s Volleyball Championships. Why not, Columbus is the volleyball capital of the Midwest and maybe, just maybe, the entire country.